The Jack Sack™: Jack Bauer's Vacation Is Over; 24 Officially Returns to TV! Jack Bauer's Vacation Is Over; 24 Officially Returns to TV! Well, call this a good day for the manpurse industry! Jack Bauer's vacation has come to an end with the terror-loving producers at FOX reviving the TV series 24. 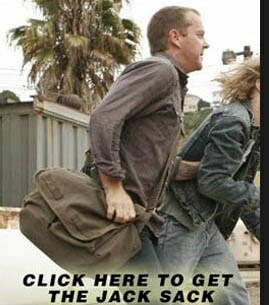 Today, news comes in that Kiefer Sutherland has officially signed to star in the further adventures of Jack Bauer. Time to start speculating on the next installment... but first, let's all sober up from our celebrating this news! We get to live tweet episodes again! Pelty and JackSack friends forever! ..glad to see you back, Jack Sack! Cirroc! I was looking for you during the Jody Arias trial. I'm glad you're sticking to ambulance chasing instead. what's the deal? when do we see some new adventures? Now this is a blast from the past! How have you been?! ?